BierYoga started in Berlin about six months ago, and I arrived at the first English-language session to find it overbooked. In typical Berlin fashion, the class wasn't going down at a yoga studio but in a nightclub pimped out with graffiti and disco balls. I bought two beers at the bar, and went to change in the dark, dirty bathroom -- awkwardly trying not to touch bare skin anywhere -- then found a space for my mat out on the dance floor. The certified yoga instructor was a 20-something Australian named Emily, who threw on a soundtrack ranging from Chet Faker to deep house, and explained a little about vinyasa and the importance of taking breaks if you ever feel dizzy or inebriated, which seem like two side effects that would definitely happen in a beer yoga class. Then we launched right into what she referred to as "pregame" -- giving gratitude to the beer by taking a few sips, feeling the bottle's cool texture on our fingers and the smooth bubbles going down. I found it totally absurd, and the wave of people cracking up around the party room confirmed I wasn't alone. But it was a welcome departure from all the uptight, super-serious yoga classes I'd been to over the years. Beer + yoga = A great way to get comfortable with strangers! "When's the last time you had your head between your legs at a club?" Emily shouts out from downward dog, beer bottle strategically sitting off to the side. "Yesterday!" somebody yells out, and we all start laughing. Everyone's passing around bottle openers, and on Emily's instruction, clinking glasses between poses with their mat neighbors. For English-speaking newcomers to the city, beer yoga is clearly a good way to meet new people. What I found most refreshing was how everyone was operating on the same beginner level; some of us may have been acquainted with mountain pose, but never while raising a Pilsner up to the heavens. And it's pretty hard for anyone to be "yogier than thou" when everybody's rolling on their back, grabbing their big toes, and doing the "happy baby at a festival" (Emily's words, not mine) pose while slightly tipsy. "Are you guys [inebriated] yet?" Yes, Emily, actually I am. My sobriety's kryptonite turned out not to be multiple reps of beer salutations, but angling into a guzzle-friendly version of pigeon pose. With one leg bent in front and the other extended behind, I had to hold the position with my hands on the ground and pick up the bottle and take a sip just with my teeth. Swallowing in that position was seriously difficult, and I ended up gulping down more than a quarter of my bottle at once. Emily let us in on the secret to mastering the drinking version of pigeon pose afterward, which apparently is pressing your tongue to the roof of your mouth to swallow. Much like the Buddha's go-to concentration technique, people. Isn't it ironic? With all this rolling around and squatting next to open bottles, I was impressed when the class ended with only three spilled beers (granted, one of them from someone who couldn't quite master tree pose while balancing a bottle on her head) and miraculously also with no shattered glass. Obviously, drinking while doing yoga has its dangers -- that's why you sign a release form at the beginning of class -- so it's important to always take it slow and listen to your body. I wouldn't recommend doing yoga while drinking wine, vodka, or anything else with a high ABV. 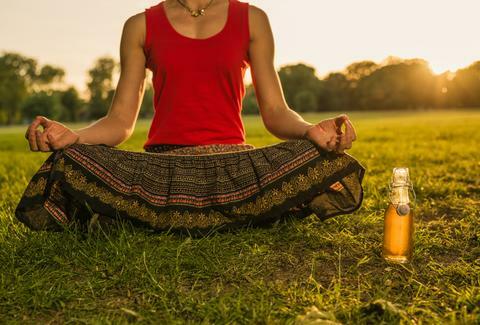 Plenty of practitioners swear by smoking weed during yoga, and I'd argue the happy, relaxed buzz that beer gives you could have certain similarities -- in appropriate amounts, of course. True yogis will probably find this entire account totally blasphemous. I'll admit that as far as fitness goes, I broke out in a sweat just a couple times, and then only barely. Was the concept of beer yoga gimmicky? Absolutely. It wasn't a workout... more my Friday night pregame. But while it didn't end up being an intense exercise of the mind and body per se, all the laughing and banter was good for the spirit. And that's just zen enough to probably get me back again sometime. Barbara Woolsey is a Berlin-based writer and a half-Asian lightweight. Follow her adventures around Europe on Facebook and Twitter.